So far, Microsoft's next-gen operating system is looking good. 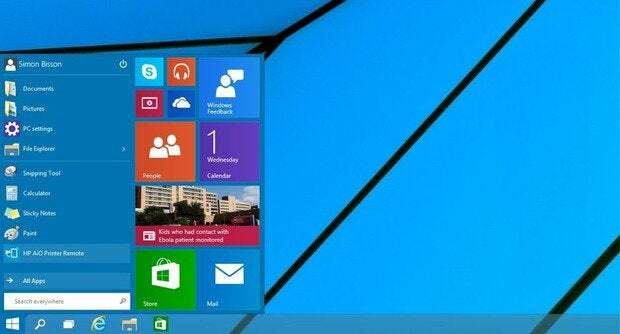 It's been nearly a week since Microsoft announced that it will follow Windows 8.1 with Windows 10 -- and released its Technical Preview so that those interested could take a first look at the new operating system. Since then I've been exploring the new OS, alongside the sparse documentation Microsoft has released. Much of the under-the-hood kernel level work has been done; the Preview is a tool for Microsoft to understand how to bring its next-generation Windows to its desktop users. That's an important problem for the Windows team to solve before the new OS is released in mid-2015. Some enterprise customers are still moving from Windows XP to Windows 7, so Microsoft needs to put in place an upgrade path from Windows 7 to this new version. It needs, as Terry Myerson, Microsoft's executive vice president of operating systems, said in San Francisco, "to feel like going from a Prius to a Tesla" -- without having to learn to drive all over again. There are actually two versions of the Windows 10 Technical Preview. The Technical Preview that most people are referring to is aimed at individual enthusiast users or SMBs and can be downloaded from the preview.windows.com site. An Enterprise Preview for volume licensing customers is available from the TechNet evaluation center. While this review focuses on the Technical Preview, as it's the release that most users will explore, I tried out both releases. There's very little difference between the two at this point, with the Enterprise Preview adding security and networking features on a par with the current Windows 8.1 Enterprise releases. As test machines, I used a Surface Pro 2 running Windows 8.1 (which I used to examine update scenarios) and a series of Hyper-V virtual machines (which I used to test clean installs). In both cases, I found the installation process quick and easy. I created USB installation media from Microsoft's ISO downloads. It's a surprisingly forgiving installer: One of my test machines was mistakenly set up with the Technical Preview release rather than Enterprise, and I was able to install Enterprise over the top of Technical Preview without having to reset the test PC between installs. One thing is clear: This is a first cut at the Windows 10 desktop experience and so naturally it is more than a little rough around the edges. This should be kept in mind. With all the disparagement of Windows 8's user interface, this was clearly the area that was going to get the most focus from testers. That's not surprising: Windows 8 was a break from several generations of Windows user experience. Windows 10 steps back into more familiar territory. Much of the criticism of Windows 8 focused on the separation between its two UI models, with desktop apps and Windows Store apps running in separate containers. Windows 8.1 started to blend the two ways of working, but Windows 10 finishes the job, mixing the two on the familiar Windows desktop. 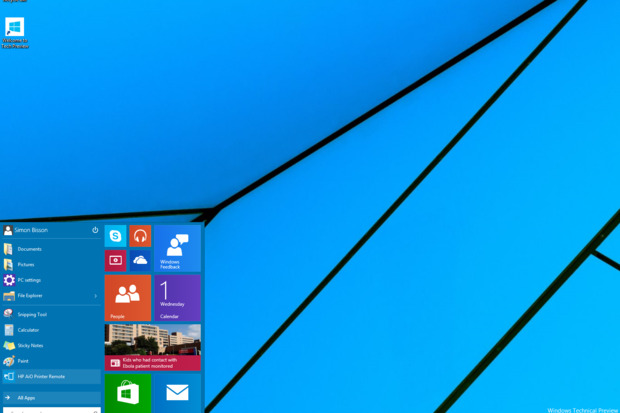 The most obvious change in Windows 10 is the return of the Start Menu. As shown at the Build 14 conference last April, it's a mix of the Windows 8 Live Tiles with the familiar Windows 7-style menu -- one right next to the other. The Start Menu is back, in a hybrid of the familiar Windows 7 Start Menu (jumplists and all) and the Windows 8 Start Screen, complete with Live Tiles. Working with the new Start Menu is easy enough: To launch it, all I had to do was click on the Windows logo in the corner of the desktop. Like the Windows 7 Start menu, it has a hierarchical list of apps and support for Jump Lists (which, oddly, fly out and replace the Live Tile section of the Start Menu). I was able to drag to adjust its height and add Live Tiles and pin apps to adjust the width. 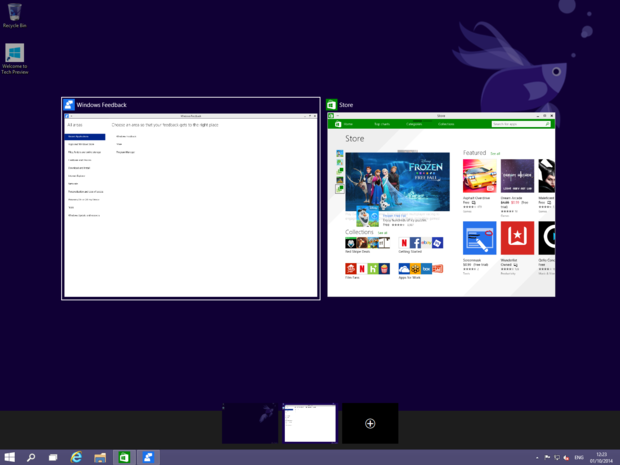 I'm still of two minds about the new Start Menu, though. It works well on a keyboard and mouse device, but Microsoft does seem to have made some odd decisions. For one thing, it doesn't support the ability to group tiles that would make the Start Screen easier to navigate. Instead, I was presented with a long string of tiles with no way of choosing how they're displayed. Of course, this is still a preliminary UI, but right now it seems a bit strange, especially with the work done in recent Windows Phone builds that add features like collapsible groupings of tiles. Tablet users will need to wait for the 2015 Consumer Preview to see the new Windows Phone-like touch UI that was teased in a couple of slides at the launch event. There's also a planned Continuum experience for two-in-one devices that will switch from a tablet UI to a desktop UI when in keyboard mode. I'll be looking forward to trying that out, as one of its target devices, the Surface Pro 3, has quickly become my day-to-day PC. One thing to note: If, like me, you do an upgrade Windows 10 install on a Windows 8.1 touch PC, you'll keep the original Start Screen. It's easy enough to switch between the two user interface modes -- though if you've filled a start screen with Live Tiles you're going to get a very wide Start Menu, as all your Live Tiles will be on the new Start Menu. Mine ended up scrolling off the side of the screen on the test Surface Pro 2. 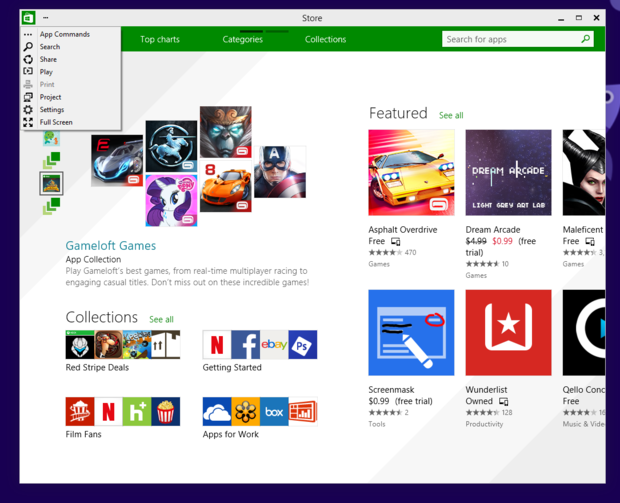 Microsoft has stepped back from the immersive model for its WinRT-powered Windows Store apps. They can still run full screen, but the default is a new windowed mode. This lets Windows Store apps run alongside desktop apps, in fully resizable windows with familiar controls. Windows Store apps now run on the Windows desktop, in their own fully resizable and snappable windows, alongside existing Windows desktop apps. There's also a new set of controls on the top left of the window that duplicates the old Windows 8 touch controls and charms. One option gives access to any app commands, while others replace the old swipe-able charms bar -- with the addition of print and project buttons. It's clear that these controls are still experimental. They're very small on a high resolution screen and don't work at all well with touch. Even so, it's interesting to see how Microsoft is thinking of delivering its new controls to a mostly desktop audience. A new drop down on the left of Windows Store apps' menu bar gives quick access to the key charms, and to print and screen projection. The Windows 8 charms bar is in this build of Windows 10; on a touch-screen device I could still swipe from the right to access the Windows 8 charms. Microsoft spokespeople were clear that this was only for the Technical Preview release, and that they were still considering how to change this behaviour. One change is already in place: Swiping from the left brings up the Win-Tab task switcher rather than the fiddly Windows 8 task view, which let me tap and swipe a carousel of my active apps and manage my virtual desktops. 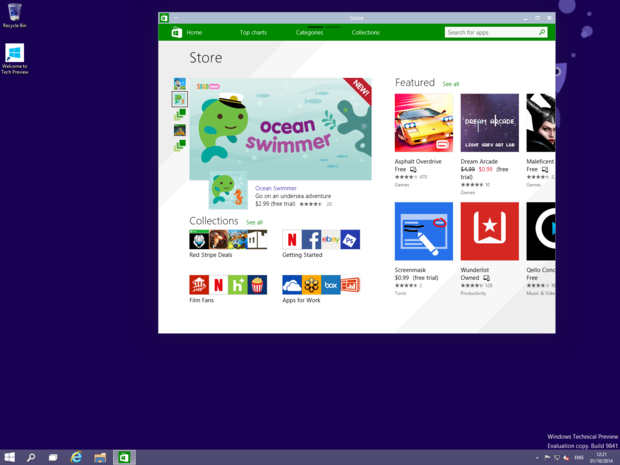 Oddly, the menu bar for Windows Store apps is a couple of pixels bigger than that for a desktop app. I found it to be a disconcerting mismatch, especially when I was tiling windows using Windows 10's new quadrant snap feature (see below). Yes, this is an early look at the OS, but when Microsoft is talking about how design-led the Windows development process is, it's somewhat incongruous. If you prefer to use Windows from a command line (after all, the good old DOS commands are still there! ), Microsoft has finally updated its Windows console with a set of experimental features. There's now support for the same Ctrl-key shortcuts as the rest of Windows (at last! ), along with the option of having a translucent console. I found that the same options are also available for the PowerShell console, something that should make IT administrators' lives just that little bit easier. 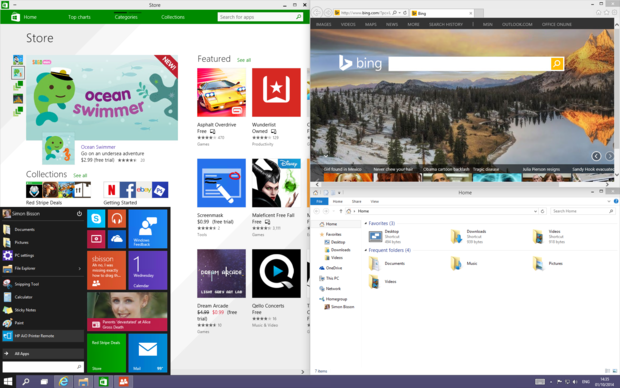 Windows 8's snap mode let me choose how to display two (or more on higher-resolution screens) Windows Store apps. It was closely related to the similar desktop Aero snap mode introduced with Windows 7. Windows 10 brings the two approaches together with a new quadrant snap mode. The new quadrant snap feature in Windows 10 helps arrange app windows, both desktop and Windows Store, to take advantage of monitor screen real estate. Quadrant snap simplifies the process of snapping more than one app to a screen. Once you drag an app to a corner, it snaps to fill half the screen, and a new snap assistant displays the remaining apps so that you can snap another, if you want. Drag a third app into a screen corner and Windows 10 rearranges the windows to create a vertical division between that app and another (with the option to pick and snap a fourth app). Quadrant view with four apps really requires a large screen to work well. Currently, Windows Store apps will only snap to half the display -- they don't support quadrant snapping. That means I was able to snap two desktop apps in the upper and lower half of the screen, while a Windows Store app occupied either the left or the right side. Like the current Windows snap tools, Microsoft offers keyboard shortcuts, adding Win-Up Arrow and Win-Down Arrow for snapping apps to the top or bottom of the screen (joining Win-Left Arrow and Win-Right Arrow for snapping them to either side). Once done, I could adjust the width and height of the snapped windows to get the optimum layout for the task at hand. The new snap features are useful, but a little odd at first. It takes some time to get used to them, and I found myself regularly disconcerted by the differences between Windows Store and desktop apps. The two should work identically, and it's somewhat jarring to realise they don't. I also miss the ability to snap Windows Store apps to one side of a desktop, a Windows 8.1 feature that proved surprisingly useful with Twitter apps and with Microsoft's OneNote. While I understand that Microsoft is yet to deliver the full Windows 10 UI, it's odd to find something that feels it should be a step forward instead appears to be a step back. Way back in the mists of time, Microsoft offered a series of Powertoys, apps that in many cases have now become Windows features. Among them was a Virtual Desktop manager that let you set up four different virtual desktops that you could use to manage your workspace -- for example, segregating personal apps from your work apps. (Vista users will remember those used for the Flip 3D task switcher.) These virtual desktops are now part of Windows 10, controlled from the Win-Tab task switcher keystroke or from the new task switch icon on the Windows taskbar. The Windows 10 task switcher now has a carousel of large live app views, and also lets you switch between virtual desktops – and create new workspaces. It's easy enough to create a new Virtual Desktop: Just click the + symbol at the bottom of the task switcher window. Apps can be launched as usual from the Start Menu or from pinned taskbar icons; Microsoft has added a set of visual cues to help locate running apps, with a small rectangle under an active app icon on the taskbar showing that the app is running in another virtual desktop. Apps running on another virtual desktop are highlighted by a small bar under the app icon on the taskbar. Virtual desktops share the same wallpaper as other desktops, and don't persist between reboots. If users are going to get the most from this approach, then Microsoft is going to have to provide a tool that lets you build multi-desktop environments that are ready to go from boot. I'm expecting to use the tool to keep mail and IM away from the screen where I'm writing in order to reduce distractions. At the launch event, Microsoft's Myerson and Joe Belfiore, corporate vice president, operating systems group, talked a lot about Universal Windows apps, a new generation of Windows Store apps based on the tools introduced at Build 2014. Universal apps are Microsoft's latest solution to the old problem of how you can deliver code that runs on Windows desktops, tablets, phones -- and, according to Myerson, on Internet of Things devices and game consoles. Instead of working on a write-once, run-everywhere system, Universal apps let you build a common core of business logic that can be wrapped in an appropriate user interface for a device. It's a sensible approach, and combined with Microsoft's relationship with cross-platform development system Xamarin, also means that apps can be delivered to iOS and Android as well.